The Jake Brake is an invaluable, extra tool available for truck drivers. It is primarily used for slowing down a big rig in certain situations. It is not intended as a substitute for the service brakes. It operates using the diesel engine’s own power. The same force that gives the truck power is used to slow it down. Some drivers like to use the jake on snow-covered roads or more questionable surface conditions. This has forever been a much debated topic among truck drivers and still is today. The jake brake is not designed for use on ice and very slippery conditions. On dry roads, the engine brake can be used at virtually any time when the driver wishes to slow down the truck. They are a great device to use in normal conditions. On slippery roads or in winter conditions, if you do decide to use it, the tractor trailer unit should be lined up and straight before engaging the jake brake. This is to avoid jack-knifing. Proper use of the jake in the mountains can add years to the life of the brake shoes of a truck. It will also save wear and tear on tires. The engine brake can help prevent brake fires caused by too much reliance on the brake pedal, by leaving the top of the grade too fast. Be sure the engine is at operating temperature and not running cold, before using it. Be sure the engine isn’t low on oil. I recommend operating the jake in the shifting range, about 1100-1400 rpm’s. It will certainly work at the higher rpm’s but the motor may suffer for it over the course of time. The driver can utilize different strengths for the jake (different positions). Different engines have different positions of strength. On a 3 position jake, position 3 is strongest and used most often. Positions 1 & 2 are used in less than favorable road conditions. Test your brake at the beginning of the trip to ensure proper operation. The Jacob’s Brake can be left on all of the time or turned on as required (old school style). It operates in a ‘no fuel position’…. driver’s foot OFF the fuel pedal. To activate, the driver takes his foot OFF the fuel (when the jake is left on at all times). It can be used in combination with the foot brake. One thing MOST truckers can agree on with it’s operation…. it is NOT necessary to have the jake operating in a truck stop parking lot! In mountain driving, I prefer to start down a grade in a gear low enough to allow the jake to do 90% of the braking. I prefer only to occasionally tap the brake pedal. This is a personal preference that has worked for me over the years. Don’t use the jake when shifting gears, as it can stall out the engine. It can be abused…. it is not meant for slowing down if the truck isn’t traveling at a controlled speed. Jakes as a rule can be pretty noisy. Many communities have noise by-laws against the use of this device. Sometimes though, it’s necessary for the driver to use it for safety reason, which ought to trump a noise by-law. The Jacob’s Brake is an extra tool available to a truck driver to utilize in particular situations. 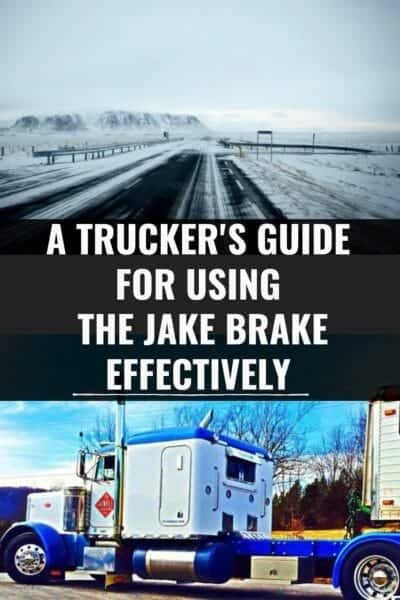 There are varying schools of thought on ‘how to use the jake brake’ in a truck. Some drivers switch on the jake when they start the truck at the beginning of the day and leave the jake switch on all day. I personally use the jake only when needed. I have found that when I shift the truck without the clutch, the jake interferes with my shift as it would engage in the middle of my shift. Before electronic motors came around, if the switch was left on, I tried leaving the jake switch on all the time. When I went into the truck stop for coffee, it would sputter away and eventually kill the engine. So, as a result, I got into the habit of only switching it on when needed. With electronic motors, the switch can easily be left on without issue. I leave the brake in the ‘on position’ also when I downshift and use the clutch as I downshift, in order that I don’t mess up my shifting. I like to bring my motor down low when shifting. My truck has a Cat engine and Cat’s are a low revving engine. It really drags the truck to a stop very efficiently. If you are on ice with a very ‘strong’ brake, you ought to be careful. There are varying positions of strength so it can be used in high, medium or low. When I engage it, I almost always use it in the ‘high’ position, to aid my stopping. However, in slippery conditions, the driver can simply use a lower setting to aid in slowing the engine down. Always make sure your engine isn’t low on oil. If you throw your brake on when the truck is low on oil, you can do damage to the engine. Also, don’t use it when it’s cold, as that can do harm to the engine as well. Be sure the engine has had ample time to warm up first. Be sure your truck and trailer are lined up straight. Don’t use it when on a corner. I use the jake brake often when I’m driving. It’s a very handy tool to aid in slowing the truck down. I couldn’t do without it. Take Down That Jake Brake Sign! The general public seem to hate the engine brake. You’ll see NO JAKE SIGNS posted in various locations, forbidding the use of the Jake. They have an overwhelming loud roar which can be quite disturbing to folks living near major highways. 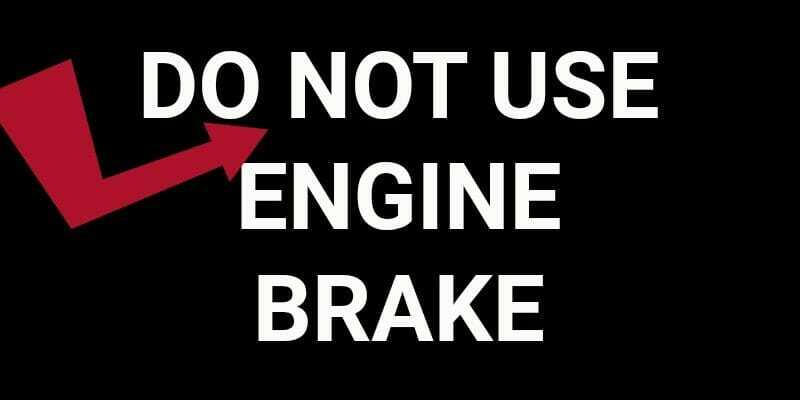 Many truckers feel a little warm under the collar when they see signs ‘No Engine Brake’, ‘No Jake Brake’, ‘Do Not Use Jake Brake’. Residents living near interstates and highways are highly irritated by the loud sounds of the engine brake of big rigs, as they descend down steep slopes and hills. The noise created by the engine brake of a big truck is loud, no arguing that point. But, the engine brake is used to slow the engine and the truck down. Our take is if residents despise the sound of trucks and the jake from nearby highways, why on earth would they purchase a home so close to the highway? Truckers have their own personal preferences regarding when it comes to use of this specialized stopping device. The tips listed above are for reference only. Always follow the instruction from your CDL training school instructor or your safety director at your company.